Justice AS Bopanna has taken oath as the Chief Justice of Gauhati High Court on Monday. 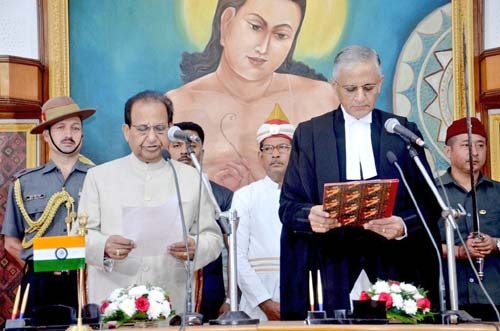 Assam Governor Prof. Jagdish Mukhi administered the oath at the Raj Bhavan. Chief Minister Sarbananda Sonowal and other dignitaries were present on the occasion. 59-year-old Justice Ajjikuttira Somaiah Bopanna, served as a judge of the Karnataka High Court earlier. Born on May 20, 1959, Justice Bopanna enrolled as an advocate in 1984 and practiced civil, constitutional, company, service and labour matters in the High Court as well as in the Civil and Labour Courts. He worked as a legal advisor to all central public sector undertakings and as Additional Central Government Standing Counsel from 1999 to 2005. He was appointed as an Additional Judge of the High Court of Karnataka on January 6, 2006, and permanent judge on March 1, 2007.